During your time at SDSU, you may be expected to take tests and exams in several categories, including quizzes, tests and finals that are part of your classroom experiences, University placement and competency tests such as the ELM, MPT and WPA and possibly National Tests, such as the L-SAT for entrance into law school. 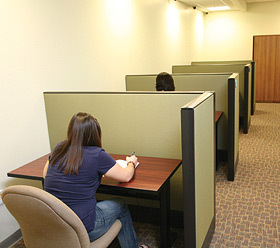 Through appropriate SASC authorization, students with documented disabilities may utilize classroom test accommodations at the Calpulli Center test facility. This may include extended test time, readers, writers, tests in alternative format, or a quiet testing environment. Once you have been authorized to receive test accommodations and satisfy eligibility requirements, visit the Test Accommodation Center in Calpulli 1300 to make your request. If you have any questions, please contact Kara Skinner, Test Accommodation Coordinator, at 619-594-7722 or by email at tac.sasc@sdsu.edu. SASC students can register for SDSU Campus tests through the online system of Student Testing, Assessment and Research and, if currently authorized, receive SASC accommodations. There are no SASC tests listed, but if a student's SDSU Red ID number and personal information are entered to register for a campus test (by the registration deadline date), a test with accommodations will automatically be offered. SASC may be able to assist in requesting accommodations (similar to those that you receive for SDSU exams) for national exams such as the GRE, Praxis, and LSAT. Check the test's application booklet for deadlines and procedures for requesting accommodations. Download, complete, and submit the Accommodation Request for National Exams. (Please submit to Student Ability Success Center in Calpulli 3101.) Please allow at least 72 hours (3 working days) for your request to be processed through SASC.